Why Did My Snake Die Suddenly? It can be a huge shock to find out that your snake has died overnight. If your snake has passed away recently, you no doubt want to know why it happened. If you have other snakes or plan to get another baby snake shortly, finding out more about snake health is essential. Why did my snake die? Almost every fatality relates to their care and living conditions. Problems with these two related factors can cause scale rot, anorexia and starvation, stress, parasite infestations, fatal viral diseases, and more. But snakes can also die of old age in captivity, even if this rarely occurs in the wild. The majority of these health issues are preventable. So, if you own any other snakes, it’s vital to take corrective steps in how you care for them. We will look at what causes snakes to die suddenly. You should also make sure that your snake is dead and not hibernating. 2.1 Did My Snake Die of Scale Rot? 2.2 Did My Snake Die of Mouth Rot? 2.3 Did My Snake Die of Respiratory Infection? 3.1 Can a Snake Die from Stress? 3.2 Can a Snake Die from Not Eating? 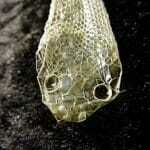 3.3 Can a Snake Die from Parasites? 3.4 Did IBD Kill My Snake? 3.5 When Do Snakes Die of Old Age? 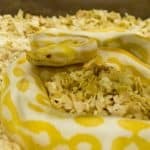 4 Why Has My Snake Died Suddenly? 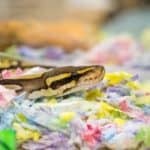 5 Why Has My Snake Died After Eating? 5.1 Can Prey Hurt Snakes? 5.2 Can Snakes Choke on Their Food? There are two main reasons why a snake might die. These are that the conditions they live in are improper. This relates to things like the temperature of their enclosure, and the cleanliness of their surroundings. They can also pass away because of conditions related to more general care, problems in which can cause stress, anorexia, parasites, and fatal viral conditions. Keeping your snake in the wrong conditions for its species is the leading cause of death in pet snakes. Compared to other common pets, snakes have demanding needs with regards to temperature and humidity. You also have to take care to replace their water bowl, regularly clean their enclosure and pick up any poo they leave behind. Failure to do any of these things can cause fatal conditions like scale rot and respiratory disease. Did My Snake Die of Scale Rot? Scale rot is a condition caused by the snake sitting in a damp substrate for an extended period of time. The snake gets an open wound on their underside, which is then infected by bacteria from the water they’re sitting in. While this on its own isn’t enough to kill them, the bacteria in the wound can then travel into their bloodstream. This is a condition known as sepsis, which is fatal. Scale rot can be entirely prevented with proper care. All you have to do is practice regular spot cleaning, where you pick out any poo or urates from their substrate. The substrate should be replaced monthly, and the enclosure should be cleaned with disinfectant on a monthly basis too. To identify whether your snake died of scale rot, check their underside. If they did, then you’ll notice at least one patch of skin that looks like a raw open wound, almost like an ulcer. The rest of the skin on their underside will be pink to red, and swollen, which indicates infection. Did My Snake Die of Mouth Rot? Mouth rot is caused by an initial injury in the mouth, which goes on to become infected. 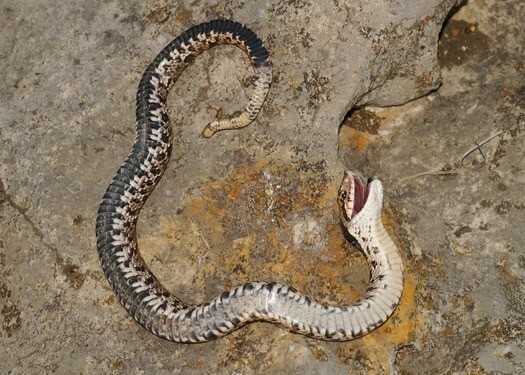 The initial problem is that the snake loses a tooth, or in rare cases, from prey bites or scratches inside the mouth. Because of unsanitary conditions, this wound then becomes infected by bacteria. Left unattended, the bacteria in this wound will multiply. For it to become fatal, the bacteria must pass to the bloodstream, where they will cause sepsis. This is what may have killed your snake. Mouth rot is easy to identify. Open your snake’s mouth with a tool, e.g., tongs, or wearing a latex glove. Check if you can see any build up of pus or any redness and swelling. If the sepsis became noticeable, then you may also see swelling and redness along the underside of their body. Did My Snake Die of Respiratory Infection? Snakes can catch respiratory infections just like we can. These affect their nose, their mouth, their throat, and their lungs. There are many signs of respiratory disease, the most obvious being a runny nose. You may also notice some drool or phlegm coming from the corner of their mouth. Your snake will also choose to breathe through their mouth at this point because their nose is blocked. In worse cases, respiratory infection affects the throat and lungs. At this point, your snake will likely be wheezing and sneezing as they struggle to clear their airways. This is made much worse by the fact that snakes cannot cough up any fluids in their lungs. That’s why left untreated, respiratory disease is frequently fatal, so this may have been the reason your snake died. The most obvious sign of a respiratory infection is your snake having a difficult time breathing. Over time, their lungs will gradually fill with fluid, which reduces their capacity to breathe. Both phlegm and pus combine to make it as difficult as possible for them to breathe. If you notice lots of phlegm or pus in and around their mouth, then your snake may have died from RI. Towards the end of the course of the disease, the snake may have reared their head with their mouth open. The point of this is to allow gravity to pull the fluids down into their lungs, leaving their airways free. If you spotted this sign, RI was the probable cause of their death. 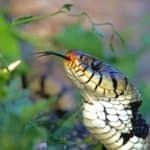 There are also many mistakes you can make concerning their care that wouldn’t occur to a novice without research, for instance, the fact that you shouldn’t house two snakes or more together. Anything from stress, to not eating to viral infections can cause a snake to become very ill.
Can a Snake Die from Stress? Snakes can get stressed, just like we can. It can be caused by both improper care and improper conditions. For example, if you house your snake with several other snakes, this can cause them stress. In the wild, almost every snake species live alone. They view the other snakes in their enclosure as competition rather than friends. This stresses them out. Improper conditions can cause stress, too. If their enclosure is too cold, they can spend almost all their time trying to escape, for example. Their inability to do so will stress out your pet snake. Over time, stress causes repetitive behaviors, like the snake rubbing their nose against the glass of their enclosure. This can cause secondary problems, i.e., open wounds and the potential for infection. A snake won’t just die from stress, but from a combination of things. The stress will lower their ability to deal with infections, and can cause anorexia which we cover in a moment. And since it doesn’t have any obvious symptoms (at least when you’re looking at a dead snake), it’s impossible to diagnose post-mortem. But it may have contributed to their death. Can a Snake Die from Not Eating? Like any animal, snakes can die from not eating. They already go much longer between lunches than we do, which is because they’ve learned how to maximize their intake from their food (by digesting bones, for example). Not only that, but they conserve energy by remaining as still as possible for most of the day, and by relying on external rather than internal sources of body heat. These factors can act on their own, or in combination with one another. If your snake died from not eating, it would be obvious. An underweight snake has a distinctive body shape. Their sides cave in, so that their cross section looks like a triangle. You can see their spine as a ridge along the top of their body, and their ribs are visible through their skin. There’s no way to definitively say that anorexia was the cause of their death, as it usually co-occurs with other problems like mouth rot. However, it can be a contributing factor. Can a Snake Die from Parasites? It’s unlikely that a snake can die from parasites. It’s almost like asking if a dog or cat could die of fleas. A regular infestation is nowhere near enough to cause significant damage to a snake. According to a paper in Acta Veterinaria Scandinavica, the exception is if there are enough fleas and ticks to cause anemia. Anemia is a lack of iron in the blood, and is usually caused by poor diet. But in the case of a snake with anemia, the most likely cause is parasites. The parasites are draining the snake of so much of their blood that they have to produce much more than usual, and end up with a lack of iron as a result. Identifying parasites is easy, since they’re all visible to the naked eye. Ticks don’t move, but hide their heads underneath your snake’s scales. Mites are smaller and like to move around along your snake’s back. They’re like tiny dots, either red or black. Both kinds of parasite like to congregate around snakes’ eyes, as well as around the mouth or nostrils. These areas have an easy supply of blood to feed on which is why they all sit in the same place. You may also be able to spot parasites around your snake’s enclosure, because they like to sit in the corner or under substrate when they’re digesting their blood meal. It’s highly unlikely that your snake died because of anemia brought on by parasites. Parasites normally co-occur with other problems, e.g., the snake being underweight, scale rot and so on. That’s because scale rot, for example, is essentially caused by neglect. When a snake is neglected, the chance of a parasite infection becoming more serious start to increase. However, it will be the fact that they’re underweight or that they have scale rot which is actually what kills them in the end. Did IBD Kill My Snake? During the early stages of the disease, your snake would regurgitate most of their food. Another early sign, which is head tremors. That they couldn’t balance, especially when they had to strike. They would see their food, but when they tried to strike, they would miss (and usually by quite a distance). A behavior called Stargazing. This is where they would appear almost to be stuck, lying normally, but staring upwards as if at something that interests them. It looks like an awkward way for them to hold their head, but they can’t seem to help themselves. IBD is passed on like any other viral infection, through contact. If your snake has come into contact with other snakes, either through being housed together or through a breeding program, then they may have caught IBD that way. But it can also be passed on indirectly. You may have handled a snake that has IBD, and then picked up your snake without washing your hands. This is enough to pass IBD on, because it’s highly contagious. Fortunately for many owners, IBD doesn’t affect corn snakes. It affects boa constrictors more than other kinds of snake. So, if you had a boa or a ball python that exhibited these signs, then they may have died from IBD. IBD is tough to miss, because the symptoms get progressively worse. What starts as a simple head tremor becomes far more severe by the time the snake is close to death. The same applies to their inability to feed, which starts as less serious, but gets to the point where it takes many tries for them to even bite onto the prey. The point of all that is to say that if you didn’t notice the above symptoms, then your snake won’t have died from IBD. But if you noticed the above symptoms getting progressively worse and worse, then IBD was likely the cause. When Do Snakes Die of Old Age? Snakes can die of old age. In the wild, snakes don’t get the opportunity to reach old age as we do. That’s because there are so many predators out to get them, and so many natural hazards that they can fall foul of, that they die long before they reach that point. Illnesses like those listed above usually take their toll before wild snakes get old. Ball pythons live for between 20 and 30 years on average. Corn snakes live for between 15 to 20 years on average. Boa constrictors live for between 25 and 30 years on average. Kingsnakes live for between 15 and 25 years on average. Burmese pythons can live for 25+ years, but typically max out at 10 in captivity because of unsuitable conditions. The same applies to reticulated pythons. If your snake reached the average age of their species above, then it’s feasible that they may have died of old age. Why Has My Snake Died Suddenly? 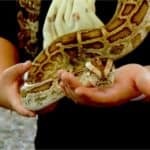 If your snake didn’t have anything wrong with them before they died, and they then died suddenly, there are a few reasons why that might have happened. They died of food poisoning. This is highly unlikely, since pinkies are raised, killed and packaged in a secure environment. If you fed them food that you raised and killed yourself, the chances of this happening may have increased. Shedding complications. If snakes can’t shed properly, this can be very bad for their health. In particular, if a little bit of their shed stays stuck on their tail, this can cause necrosis. In turn, this can cause sepsis (blood poisoning) which can kill your snake quickly. Sepsis has other causes too. Any wound that isn’t properly taken care of, i.e., by disinfecting it, stands a chance of causing sepsis. That’s what both mouth rot and scale rot are. With proper care, it’s unlikely that any snake will die of anything suddenly aside from old age. To prevent it from happening again, perhaps pay closer attention to the health of your snake on a daily and weekly basis. That way, you can note the course of any problem they have, and stop it from getting any worse. Why Has My Snake Died After Eating? If your snake has died just after eating, it’s most likely going to be food poisoning. Again, this is highly unlikely, but it has been known to happen. But what else might the problem have been? In some circumstances, prey can harm a snake. Of course, we’re only talking about live prey here. If you feed your snake freshly killed or frozen and thawed prey, then this obviously can’t happen. But there are many ways that prey can hurt a snake. The most obvious is that when the snake first attacks the prey, the prey kicks and scratches at the snake’s face. If they catch the snake on their eye, this could potentially cause them some severe damage, opening a wound or even blinding them. The worst is if the prey manages to bite the snake, especially on the eye. Aside from that, one rookie mistake that some owners make is to leave a live prey item in an enclosure with a snake that doesn’t want to eat it, in the hope that ‘eventually’ the snake will get hungry and eat it. This is a terrible idea. Why? Because that prey item will get hungry too, and when they do, they can actually start trying to bite your snake. They won’t manage to eat your snake entirely, but these wounds can turn septic. And, as we know, sepsis can kill very quickly. 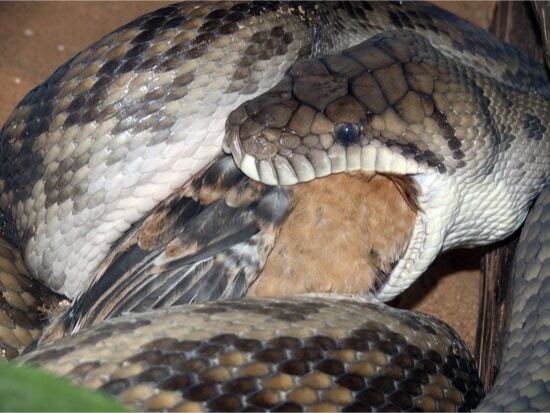 Can Snakes Choke on Their Food? If you didn’t know, snakes only very rarely choke. They have a small organ called the glottis, which is the top of their windpipe. But unlike the top of our windpipe, it actually pokes out like a tiny tube into their mouth. That’s because when they breathe through their nose, they place the glottis against the inside of their nostrils so that they breathe directly into it. Anyway, the point is that snakes use their glottis to avoid choking. When they eat, the snake will poke the glottis out as far as they can, even if it ends up hanging out the side of their mouth. That way, even if they have a meal that takes hours to fully swallow, they can keep breathing exactly as normal. However, that’s not to say that snakes can’t choke at all. If a snake overeats and tries to regurgitate their food, it can become stuck in their esophagus. If they can’t budge it no matter how hard they try to regurgitate, this can reduce the amount of air they’re able to breathe in, since their last meal is stuck in their throat. This situation requires an emergency intervention, which doesn’t always work, where a vet tries to lubricate the snake’s throat to make the food easier to pass. If your snake died after they ate, this might have been the issue. Sometimes there’s no clear reason why snakes die. There may have been a clear-cut reason, but there’s also the chance that they met their end in some way you’ll never understand. As an owner, it’s important that you learn how to improve your care for your pets. Take a little time to process what’s happened before moving on, and perhaps becoming an even better owner. Why Is My Pet Snake Suddenly Aggressive? Why Is My Snake So Active? Why Do Snakes Hiss at You?